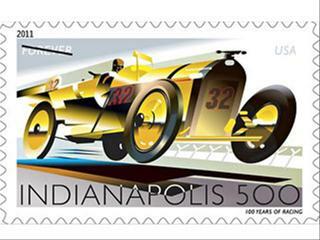 Last May, the US Postal Service released a stamp honoring the 100th anniversary of the Indianapolis 500. The stamp shows the Marmon “Wasp” in an Art Deco style. The car is lifting off the ground, with the wheels leaning forward. 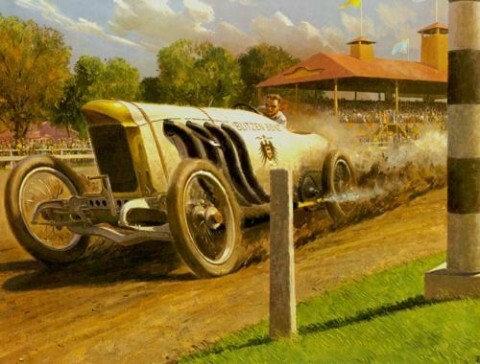 The “leaning wheels” look was probably influenced by the illustrator Peter Helck, who was renowned for his pictures of early race cars. In both of these pictures, the artists made deliberate artistic choices to make an aesthetic point, which is completely OK. But I wouldn’t want to ride in either of those cars, though, whatever the speed. Why? In real life, the axles on that poor car would have to be broken -- or those wheels would have to be out of round. 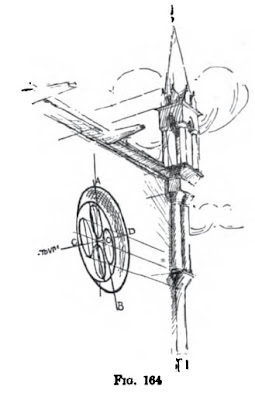 Similarly, a round window seen in perspective above the eye level follows the same rule. The long axis (AB) is perpendicular to the short axis (CD), which vanishes along with the other lines to the horizon at left. 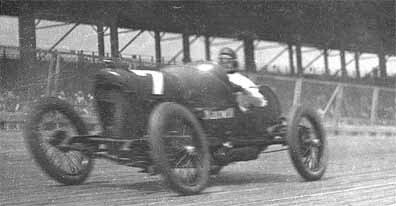 Addendum: In the comments, several people pointed out that early action photography often used a slit shutter, which traveled upward vertically, capturing the subject at slightly different instants in time. This photographic technology resulted in images which actually did have this "leaning forward" quality. Above is an example. 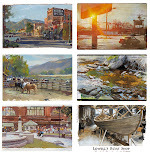 Thanks, Mike, PeteJoe, The Jalopy Journal, and those who commented. More about the stamp at Indianapolis 500's site. 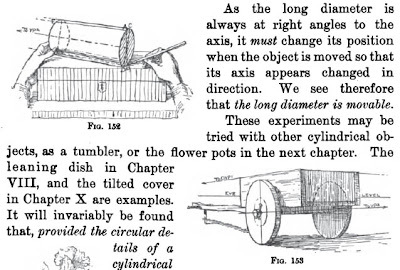 The diagram is by Dora Norton from her classic book Freehand Perspective and Sketching. The leaning wheels convention in automotive art stems from the curtain-style focal plane shutters used in the photography of that era. A slit in a moving curtain - similar to a miniature window shade - moved over the front of the glass plate or film. The image was thus exposed sequentially from bottom to top (inverted in the camera). Since the car was moving at high speed it appears to be leaning. Although each piece made use of the same effect of the leaning wheels to indicate motion, it seems to make more sense in the 2011 stamp as it appears the wheels and axle are above the horizon (albeit from an equally improbable scenario of the car taking off the ground) and therefore should lean forward. ...an equally improbable scenario. Unless it's the General Lee. Great advice! In the building example, I think I would have (incorrectly) made the long axis follow the vertical perspective lines. By the way, your "Freehand Perspective and Sketching" and "in print" links are broken. Robert, armel, interesting, i would have thought it an artistic choice to convey speed, but it might be an artistic choice, how technology portrays speed...if that makes any sense.. Thanks, everybody. Great insights. I forgot about the slit camera. Charles, I put in a new link for the book. That's a cool looking postage stamp. It looks like it was done in airbrush. Maybe it's just me, but I'm not convinced by the circular window drawing/argument. Compared to the edge of the building, the window looks "off" to me. Why shouldn't the long axis of the window follow the same rule as the edge of the building, which I take to be perpendicular to the horizon. Or is this a quetion of two point perspective...maybe I missed that, if so. Then again, I've only had one cup of joe so far this morning. James, I agree with Tom's comment above that the window of the building (and even moreso the smaller windows) looks somewhat off. Wonder if anyone reading here might remember an American perspective book I'm trying to find. My grandfather, a technical illustrator, gave it to me when I was 6. 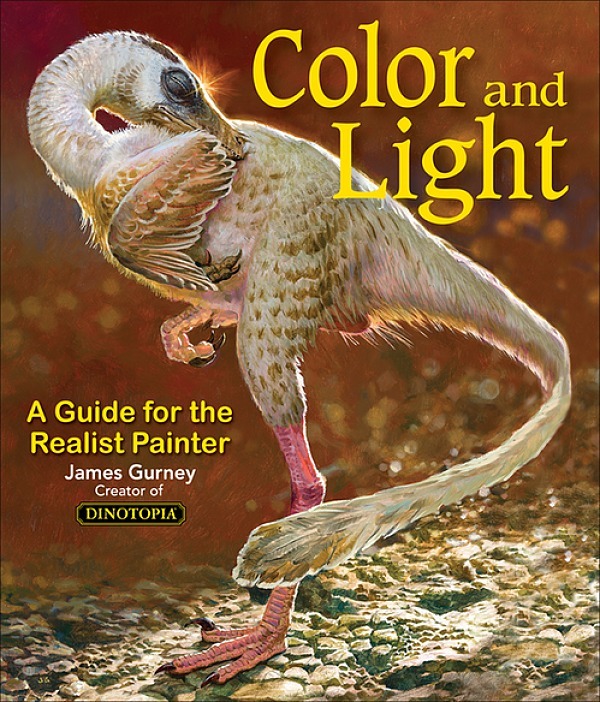 Now I'm a professional artist with a few grey hairs, I'm still frustrated by it's half-remembered illustrations. I know only that it was the first time I ever heard of a place called "America", so it must have been American, and that it had a very tall fat, possibly bald, man on one side of the cover with various dramatic perspective tricks occupying the middle ground. The cover was in colour but the pages were all monochrome. It was large, perhaps even A2, but without very many pages and seemingly aimed at children or beginners. I'm hoping this description jogs someone's memory. Runninghead: It sounds like you're describing "Perspective Drawing," by Ernest Norling. It was a large, inexpensive book published by Walter Foster, and it was the book that taught me perspective when I was a child.